Proteus, belonging to the tribe Proteae, is a part of normal gastrointestinal flora, widely distributed in nature as saprophytes. These bacteria are non capsulated, motile rods by peritrichous flagella. They exhibit a wide range of biochemical and antigenic heterogenicity. They are causative agents for urinary tract infection, wound infection and pneumonia. The genus Proteus includes two species of clinical importance – P.mirabilis and P.vulgaris. They grow on almost all simple media and easily identified by its swarming motility and fishy odor. A notable property of Proteus is the ability to swarm on solid media. Discrete colonies are seen in young cultures but thereafter actively motile cells spread on the surface of plate in successive waves to form a thin layer in concentric circles. WHY DO THE PROTEUS SWARM ? Swarming takes place in a discontinuous manner each period of outward progress followed by a stationary period. swarming growth is a problem in the laboratory when mixed growth is obtained in which Proteus bacilli overgrown with other bacteria. Several methods have been devised to inhibit swarming of Proteus. 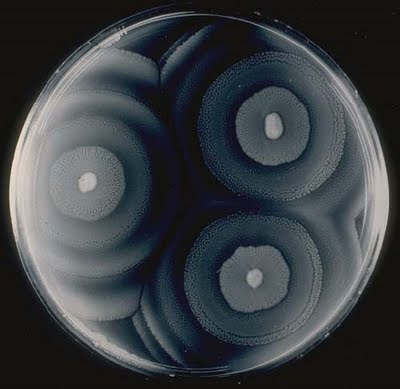 Ø Increase in concentration of agar upto 6% inhibits migration of Proteus and consequently isolated colonies are formed. Ø 0.02% tannic acid –tannic acid binds to outer membrane of cell wall inhibiting the movement of flagella. Ø 20mM salicylate decreases motility of Proteus. Ø Incorporation of Boric acid – 1:1000 form complex with flagellin and cause disintegration of flagella. Thus inhibiting migration and prevent swarming. Ø 1x106 Plaque forming units/ml – Phage X7 is a flagellotropic phage for Proteus. Ø The addition of 0.2 ml of phage spread over the surface of agar plates and immediately immobilizes the Proteus. Ø In fish meal extract agar with NaCl swarm cells were not formed due to deficiency of glutathione, viscous environment and flagella rotation inhibition. Ø Effect of sodium tetradecyl sulfate immobilizes the strain by inhibition of flagella formation or by some lytic action on flagella. Ø Phenyl ethyl alcohol – concentration of 5 to 6% impairs flagella function but leaves the flagellum morphologically intact. Ø Addition of ferrous salts to protease peptone medium inhibits flagellar function without affecting growth of the organism. Ø Cystine Lactose Electrolyte Deficient medium (CLED) – peptone base agar with lactose and L-cystine restriction of electrolytes inhibits swarming of Proteus. Ø Media containing activated charcoal (1% w/v charcoal in nutrient agar base) inhibits swarming but not the growth of Proteus. The suppression depends on the concentration of charcoal in medium. It does not interfere with flagella production. Ø Chloral hydrate and Sulphonamide inhibits swarming when added to media. Ø Predried plates with para nitro phenyl glycerine inhibits swarming without imparing motility. It has long shelf life, heat stable and convenient to use in preparation of media. Ø Selective Proteeae medium (SPM) contains tryptose phosphate agar, phenolphthalein monophosphate, bile salts and polymixin B – inhibits swarming. Ø Bismuth Sulphite in Wilson Blair medium. Ø Use of monopterenes (terpenes & terpenoids) and psychotropic drugs (serotonin & sertalin) inhibit swarming of Proteus. Swarming motility is a rapid (2-10 μm/s.) and coordinated translocation of a bacterial population across solid or semi-solid surfaces. This type of motility is an example of an emerging concept in microbiology : bacterial multicellularity. Swarming motility was first reported by Jorgen Henrichsen and has been mostly studied in genus Serratia, Salmonella, Aeromonas, Bacillus, Yersinia,Pseudomonas, Proteus,Vibrio and Escherichia. This multicellular behavior has been mostly observed in controlled laboratory conditions and relies on two critical elements: 1) the nutrient composition and 2) viscosity of culture medium (i.e. % agar). One particular feature of this type of motility is the formation of dendritic fractal-like patterns formed by migrating swarms moving away from an initial location. Although the majority of species can produce tendrils when swarming, some species like Proteus mirabilis do form concentric circles motif instead of dendritic patterns.